Masterchef and Shark Tank can’t come soon enough for TEN with Sundays proving to be continued trouble. For the third week in a row it was unable to rise above the 500,000 mark with Modern Family (444,000) its best in show. 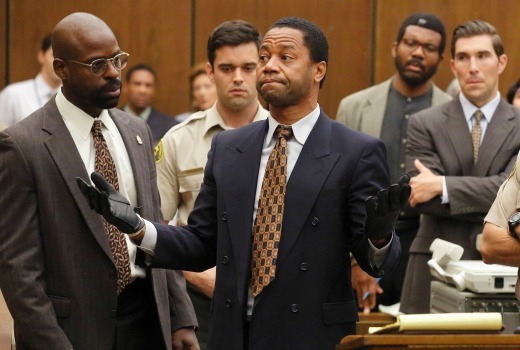 American Crime Story is turning on the courtroom drama but is just not resonating with Aussie audiences -just 252,000 viewers. In Timeshifted viewing, it has previously picked up extra viewers above 100,000. My Kitchen Rules* was best for Seven at 1.37m viewers, while Sunday Night slipped from last week’s 994,000 to 860,000*. Despite off-screen dramas 60 Minutes lifted for Nine, from 694,000 to 849,000. You’re Back in the Room slipped again for Nine, from 890,000 to 800,000 but managed a top 5 demo ranking. Attenborough’s Great Barrier Reef rose from 815,000 to 849,000 for ABC. Seven network won with a 33.9% share then Nine 28.9%, ABC 17.4%, TEN 13.7% and SBS 6.1%. Seven advised of a coding error for its titles. Those adjusted numbers were My Kitchen Rules (1.37m*), Seven News with 1.35m*, Sunday Night (860,000*) and The Blacklist was 376,000*. Nine News (1.15m) led for Nine then 60 Minutes (849,000) and You’re Back in the Room (801,000). A replay of the telemovie Beaconsfield was just 288,000. David Attenborough’s Great Barrier Reef drew 849,000 for ABC then ABC News (805,000) and Call the Midwife (636,000). Compass was 262,000 and Stephen Fry: Out There just 160,000. Modern Family (444,000 / 394,000) was best for TEN. TEN Eyewitness News was 368,000, Scorpion was 348,000 and American Crime Story was just 252,000 / 243,000. On SBS it was Vietnam The War That Made Australia (193,000), SBS World News (182,000), Lost City of the Gladiators (178,000) and Untold Australia (128,000). ABC2’s Ben and Holly’s Little Kingdom topped multichannels with 230,000. And yet Ten are still foolishly chasing the 25-54 demographic. how is that foolish? When advertisers care about that particular group. Why change it, when Ten is going strong that demo. They’ve got a 28.7% network share in 25-54, which is their highest since 2011 and 2012. William I’m presuming that number is fashioned from 6-10:30pm commercial share (3 networks). At 6pm – midnight for 5 networks it would be lower. I will check. The OJ series is best watched all at once. A friend watched the whole series over a weekend, although the last episode is about 20 minutes too long. >> Despite off-screen dramas 60 Minutes lifted for Nine, from 694,000 to 849,000. Exactly, altho’ I don’t think the 60 Minutes crew will consider their off-screen dramas to be worth the modest increase. The Blacklist had a six week break in the US. We actually caught up with them this week so they can actually claim to ‘fast track’ it and not need the asterisks. The last three weeks have been ‘fast-tracked’ – Screened Thursday night in USA – then screened Sunday night here. 2 days. I’m happy with that. But there appears to be no scheduled dates in America for the last 3 eps of this season. It could have something to do with Megan Boone’s pregnancy – she’s due in June. Blacklist is out this coming Sunday. I have to say 60 minutes Beaconfield story was good last night.